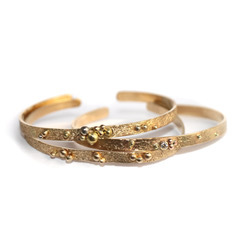 Jessica Noelle Huard is an experienced goldsmith, stone setter and jewelry designer. She employs ancient metal working techniques such as enameling, overlay and lost wax casting. Her work has a heavy emphasis on hand fabrication which is why each piece has its own unique identity and character. Her work is passionate inspired by art history, nature and her desire to create timeless opulence.